Well, it’s that time that’s between Halloween and Thanksgiving, when everyone’s kind of dreading the upcoming Christmas onslaught before it’s even Black Friday. There’s no big festivals going on this weekend and you might be looking for something to do. We received an email from Seasons Olive Oil and Vinegar Taproom that says they’re having a holiday open house from 12 to 4pm on Sunday. If you’ve never been, or have been looking for a reason for a return trip, this might be a good time. 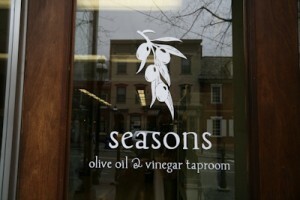 They’ll be sampling best sellers and new arrivals of their (admittedly really damn tasty) olive oils and vinegars. Even better? Free food featuring their oil, vinegar, salts, and spreads.